We are a small and friendly establishment offering rabbit, guinea pig and other small animal boarding. Over the years, we have owned and cared for lots of different pets including, dogs, cats, rabbits, guinea pigs, hamsters, fish and birds. Being massive animal lovers is a big part of our family and caring for animals is really a passion we share. Welcoming animals into your home takes a lot of time and effort devoting your care and making sure your furry family members are as happy as can be. So while you're having a break away, send your pets to us and they will have guaranteed love and cuddles until you return! All pets have individual accommodation. Most of the hutches are kept in a large summerhouse at the end of the property but there are also hutches outside of the summerhouse. We can accommodate two rabbits/ guinea pigs in same hutch if your pets are used to living together. We also have large two tier hutches that can accommodate three/ four rabbits or six guinea pigs. The summerhouse is closed and locked at night for security. We provide all bedding, fresh fruit and veg, hay and always fresh drinking water. We recommend you bring your animals dry food for the duration of their stay to avoid upset tummies. Small animals in their cages are kept in our house. We can accommodate indoor rabbits or guinea pigs in our indoor room, if your pets are used to living indoors. There's lovely large rabbit runs in our large garden with toys and tunnels, where your pet can play. The runs regularly rotate around the garden so your pet will have plenty of fresh grass to nibble on. The summerhouse has play pens in case of bad weather. We also have an indoor run for our indoor guests if there not used to going outside. All hutches and cages are fully cleaned disinfected and air dryed between guests. All soiled bedding is removed and replaced daily. Rabbts must be vaccinated against VHD and Myxomatosis before they board with us, and proof of vaccination is needed. In the event of an animal being taken ill veterinary care will be sought at the expence of the owner. My own Vet is in walking distance of Apperley Lodge. Medication can be administered if required. 2 Guinea Pigs....£6 per day. Hamsters....£2.50 per day in own cage. Dwarf Hamster..£2.00 per day in own cage. Mice....£2.00 per day in own cage. Gerbils....£3 per pair, per day in own cage. Rats....£4 per pair, per day in own cage. Chinchillas....£5 per day in own cage. 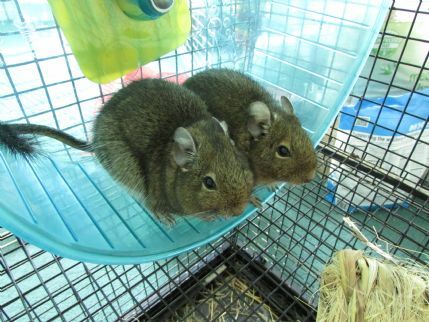 Degus....£4 per pair, per day in own cage. Small birds Budgies/ Canaries £3 per day in own cage. Medium birds Parrots / Cockatiels £4.00 per day in own cage. Large birds African Greys £5.00 per day in own cage. £10 Deposit per hutch is required for guests staying 1 week or more. And £5 for guests staying less than a week. All non refundable if you cancel. No deposit required for animals in own cage. Full fee payable on check in by cash only. I can do home visits for any pets including dogs or cats. For £5 per visit plus 50 pence per mile. Drop off and collect service available, charged at 50p a mile. I can keep you posted by Email, Facebook, Whatsapp or Text with pictures of your pets if required. Please feel free to contact me to discus any requirements. Boarders Response:Thank you so much Emily, it was my pleasure to look after them..
A great home away from home for our rabbits - Jacqueline looks after them very well. Our guineas have stayed twice now on their summer holidays and we'll be very happy to leave them here again next time. Everything seems well maintained and the guineas came home happy and healthy. Thank you! Our daughter's hamster had a lovely time staying here for 10 days and was made a fuss of and looked after very well. We would happily bring her again as she was quite spoilt! A great find, very pleased. Olaf and Toothless had a great stay here. The owner is lovely and really looked after our Guinea Pigs whilst they were in her care. Will definitely recommend and use again. Ratties were really happy here, well looked after, came back clean and healthy after a weeks holiday. Will certainly use again. We are in the BD10 area near Greengates. Leeds /Bradford airport is 4.1 miles away. And there's a new train station at Apperley Bridge. Check in and pick up times will be arranged individually with the costumer. Apperley Lodge is open all year. Please feel free to call us to discuss your pets requirements.